Go to the bottom of this post to join the party. 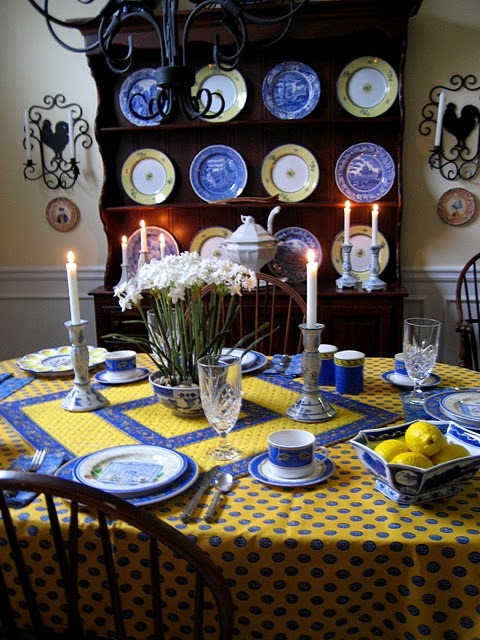 Today we are touring the beautiful home of Debbie @ Confessions Of A Plate Addict. Debbie’s blog was one of the first ones I found when I started blogging. How could I not fall in love with a blog that featured Quimper, blue and white and fabulous French design? 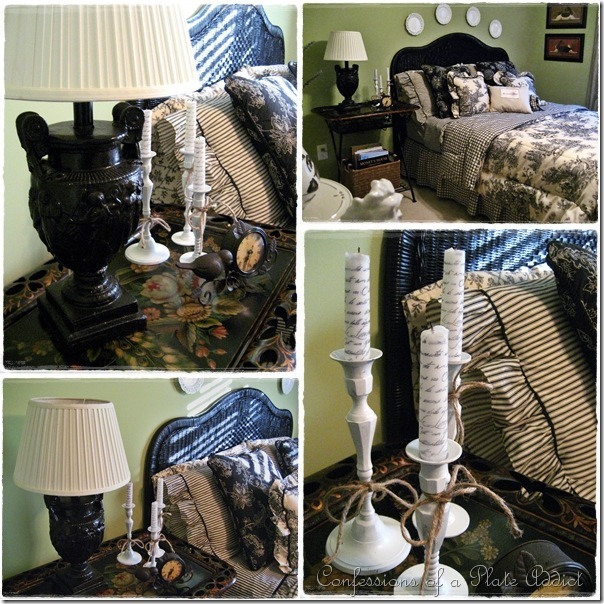 It is no coincidence that Debbie loves decorating with France in mind. She is a retired French teacher and moved to France until the birth of her first grandson brought her home. Debbie and her ten year old grandson just recently returned from a trip to France. Check out her blog to see all the wonderful pictures of Paris. Enjoy the tour of this lovely home.
. You must drop by and see more of this wonderful home and Debbie’s amazing Quimper collection. Thanks Debbie for opening up your home for our tour. Debbie has a beautiful home Sherry, thanks for showing us. Will head on over and check out more of it. Hi Sherry! Wow! Back to our regularly scheduled programs/parties, huh? 🙂 I love the feature home this week and as always appreciate you hosting such a fun party! Sherry this is such a beautiful home! Beautiful home! I love that she loves plates too! Debbie has a beautiful home and a great blog. Love her blue and white always! Thanks for having us. I love Debbie's house. Maybe one day I will see it in person. She just lives down the road a bit. Thanks Sherry for a great post. Debbie is a sweetheart, and I've enjoyed getting to know her after I started blogging. She has a lovely home, and I enjoy all she shares about her time in France. She has such lovely collections, one of my favorites being her Quimper. Thanks for featuring such a lovely lady. Thank you Sherry for hosting your fabulous party. Hope your July fourth is great. Thanks for showing us Debbie's gorgeous home. Love, love, love all those plates she has displayed in her home. 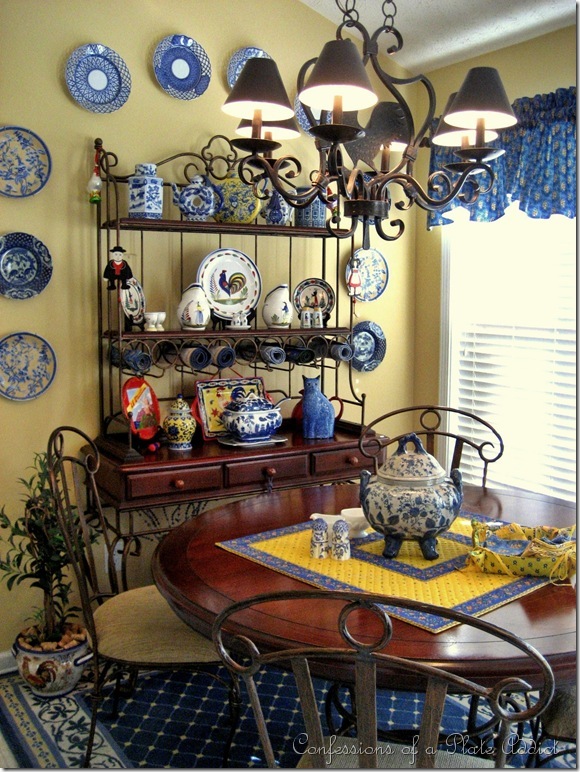 Hi Sherry, such a lovely home….I am a huge plate lover also. Thanks for hosting…this is my first time joining. Love the idea! Thanks so much for hosting yet another party! I'm loving all the plates this lady has, wow! Sooo much to look and gaze upon. 🙂 Thanks for sharing. I love all of her colors. Her home is very inviting. I especially love those tapers with the French script on them! such a beautiful home! thanks for sharing!! 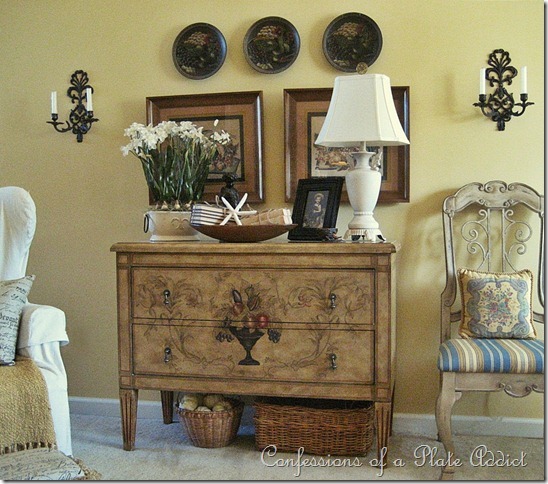 I love Debbie's home and she is one of the first blogs I found too! She is so talented and so creative and she does it all on a budget too! Hi Sherry, love your home tours. 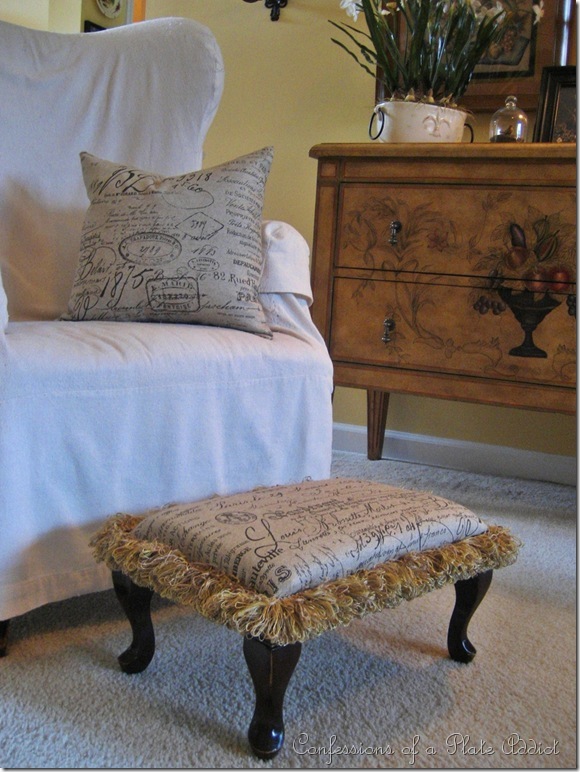 Love all the Frenchy-ness of Debbie's house, she has a great blog, plus I love all her kitties! Thanks so much for the beautiful house tour. Love the decor. Thanks, as always, for hosting. Debbies house is just so lovely! What a fun tour! thank you for hosting. What a wonderful hostess you are, Sherry. I have been a huge fan of Debbie's for a long time. She really rocks at decorating. What a beautiful home. 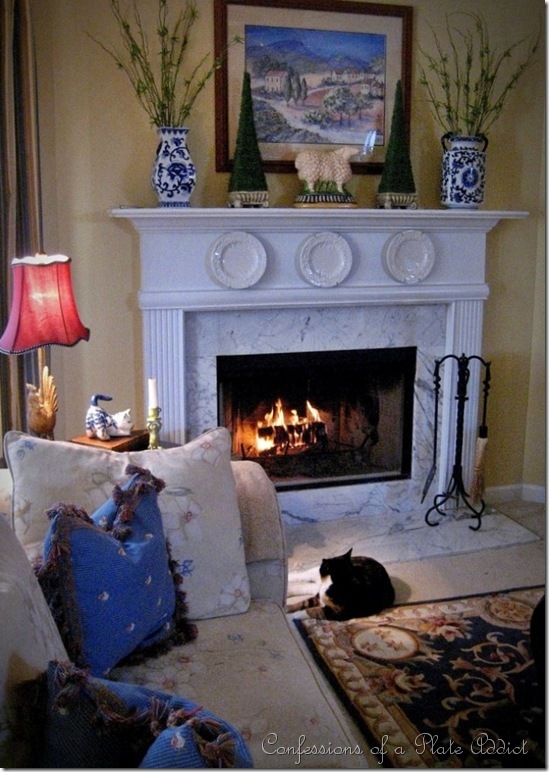 I especially love the picture of the cat lounging in front of the fireplace. oh my gosh, i just saw your french vanity! it's fantastic! thanks so much for hosting, i'm putting your link in my sidebar since i'm partying here, too. i hope i remember for next time! Debbie's house is so beautiful! I love her green bedroom. Thanx for sharing it with us! Yes I agree with everyone else Debbies house and dishes are so pretty. I agreee she has a gorgeous home. I linked up my back porch. And I ordered that toweling you showed earlier that you used as a table runner. Can't wait to see it when it arrives. I loved the tour of this home. I have a weakness (obsession?) for plates, so I found it fascinating to see all of the ways that she used them in her decorating. Looking around our house I see that I could really use some more. 😉 Thanks! Oh how I wish you all lived with me. I see no residue of children.lol Beautiful home! Debbie has an gorgeous house and beautiful style. Thanks for hosting Sherry. Have a wonderful 4th! Hi again! I am your newest follower. Happy Fourth! Morning! I just sent an email, ignore it Sherry. I hadn't had my coffee yet.lol. The up side is I looked again at your inspirational blog. 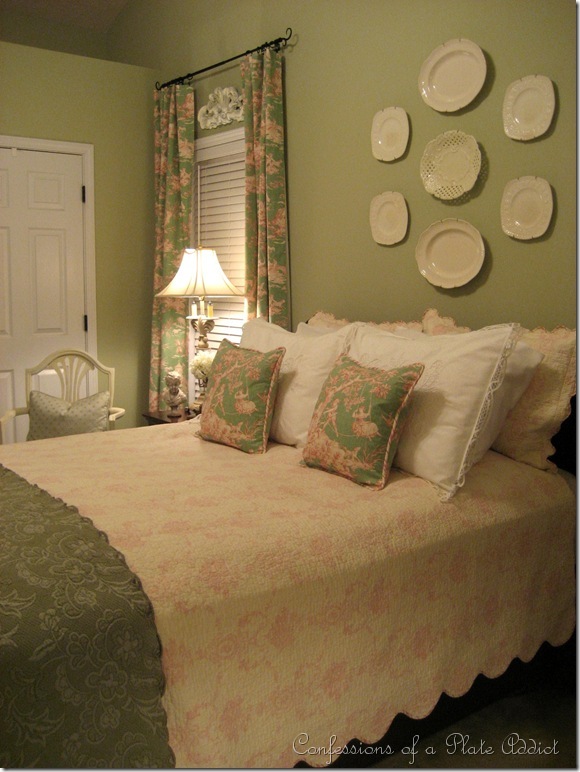 love the plates on the wall above the bed! Also like your tribute to your french teacher. Tres Bien. xoHappy 4th!